Address: 119 Lavender Street, Singapore 338731. It was sunny and hot day to walk out for lunch and it was too boring to eat around our office, so we ended up somewhere nearby, not too far away from our location. It is a franchise Bak Kut Teh’s restaurants, Koon, which can be found in several locations in Singapore. I ordered the Singapore Braised Meat Rice for myself and the rest of them tried the Signature Sesame Oil Chicken. 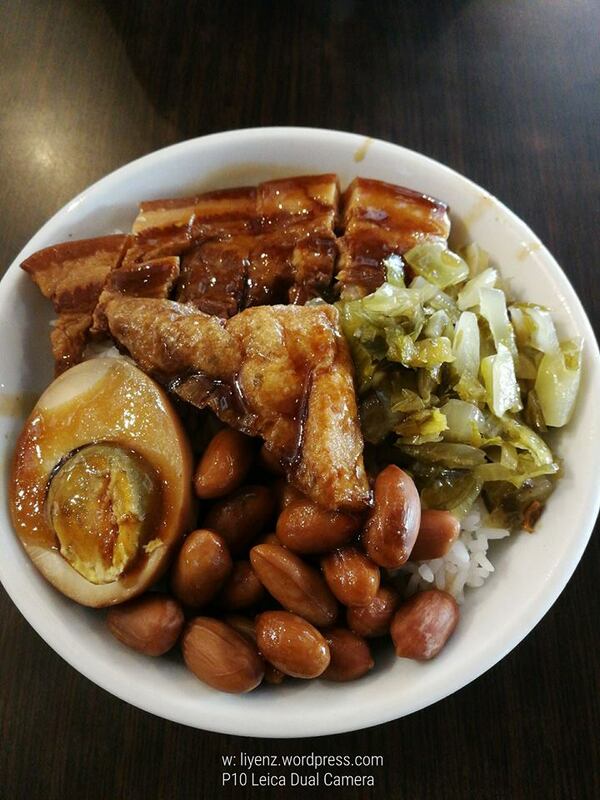 It came with few pieces of the braised pork belly, braised half boiled egg, some salted vegetable, braised peanuts and half piece of the fried tau pok (beancurd) on top of the white rice in a small porcelain bowl. The well braised pork belly were quite fatty as usual and it melted in my mouth easily. With the braised meat’s sauces, the soft peanuts and the salted vegetable mixed well with the white rice. It could be one of the good choice of dish if you do not want to eat bak kut teh at this restaurant. Besides, braised half boiled egg, you can change it to salted egg too.